"Practical and must-read advice. This book is exactly what the next generation of entrepreneurs needs." 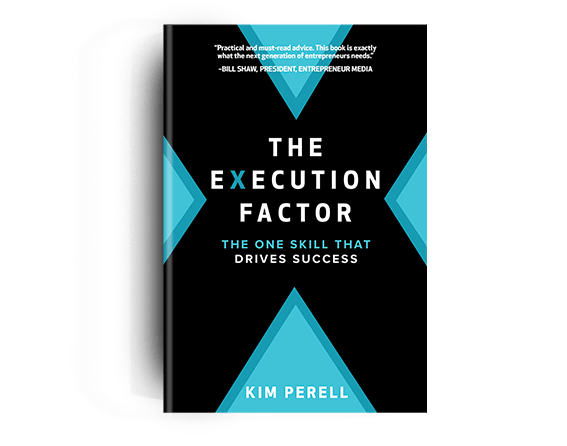 of examples and applicable process, Perell has created essential reading that cracks the code on how to drive success in your life and work." - Erica Golden, Global Talent Development, Apple, Inc.
"The Execution Factor should be read by all entrepreneurs or anyone looking to take their career to the next level. Pay attention and take notes—this book is a blueprint for success. - James Borow, Global Director of Product Strategy, Snap, Inc.
and inspiration in The Execution Factor. I wish I had this book when I was starting out." I am thrilled to finally share my book, The Execution Factor. Little did I know, I have actually been preparing to write this book from the moment I made my first deal at 8 years old. This book offers a straightforward approach to success that anyone can master. I went from broke to millionaire in just a few short years. And looking back the one skill that drove my success more than anything else was execution and I want to teach it to you.